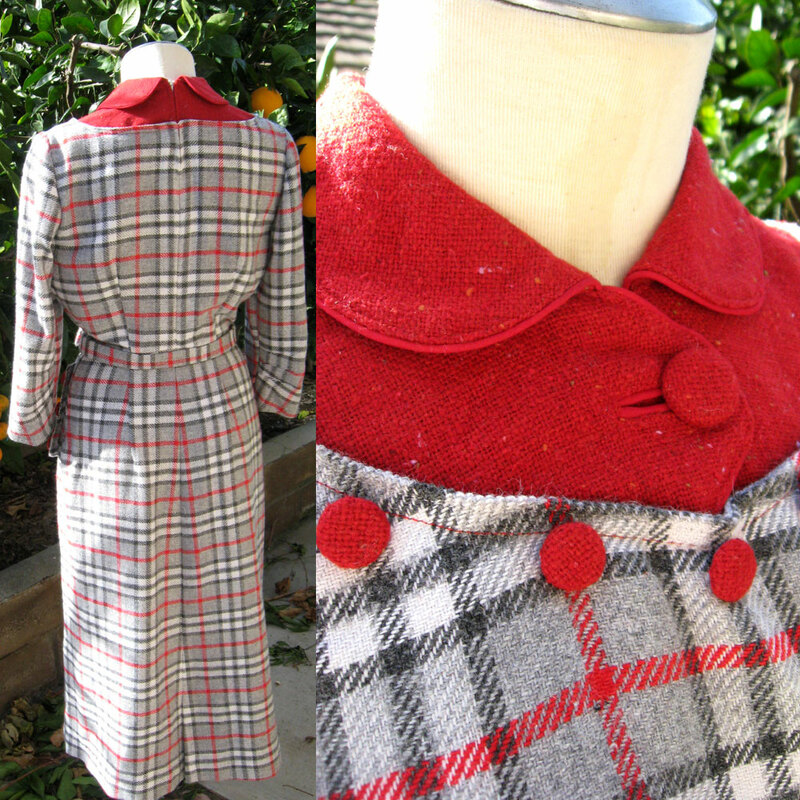 Home » 1950s » >The Christmas Dress- Finished! >Horray! I finished! I posted a while back about wanting to make a Christmas dress, and although I didn’t use the pattern I originally wanted to, I’m super happy with the results. I used Simplicity 3363, which is actually up on my Etsy store right now. 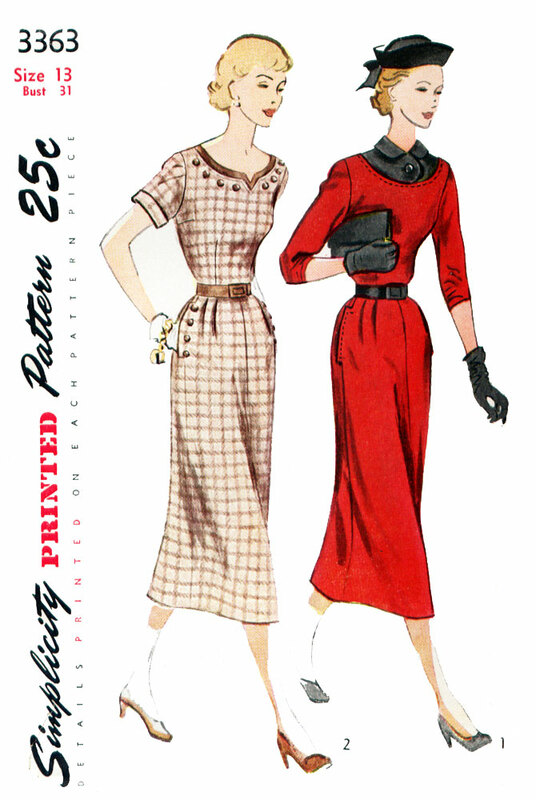 I chose this pattern because I liked the sleek line, but I also liked how easy it looked to match the plaid- a few center seams isn’t too hard to do- a lot easier than a shirtwaist style- and I liked the longer sleeves for winter wear. I didn’t realize how many fiddly little details it had, though, and of course I made it even more complicated by wanting covered buttons and a belt! My husband was a sweetheart- he likes doing fiddly little crafting things like that- so one night he sat with me and covered the buttons and belt buckle while I hand sewed the belt. This fastens not on the side seam of the skirt since those are placed more towards the back, but through a dart that you face that matches with the side seam on the bodice- something I personally had never done before, but it came out really pretty! Of course, after doing all that I wasn’t going to slap a zipper in by machine so both the side and back zipper I sewed in by hand and I got to raid the old metal zipper stash where I luckily had two around the right length. I had fun putting in a buttonhole bound with piping. I love the way bound buttonholes look and this was my first attempt at a piped one. Fun! So here she is! All finished and ready for tomorrow. 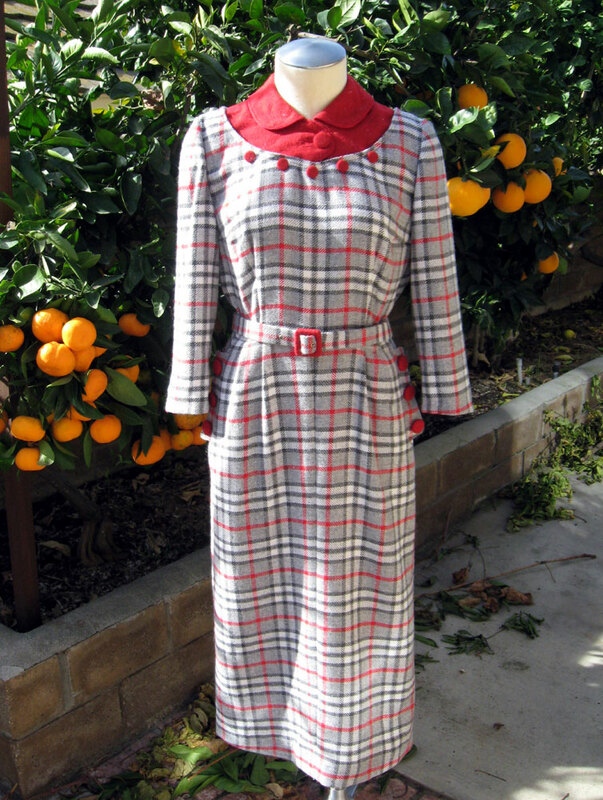 I kind of made up a combination of the two views on the pattern, but I thought the buttons were just so much fun on a tailored dress that I didn’t want to tie myself down to “view a” or “view b”. I love this picture because it shows our California citrus in the winter! I’m not sure if I’m going to be posting tomorrow, so have a very Merry Christmas and God bless you and your family! 15 Comments on >The Christmas Dress- Finished! >Oh, I adore this. So perfect! I love the buttons, especially. >Just gorgeous…I'm sure you'll look stunning in it! >That turned out absolutely gorgeous! 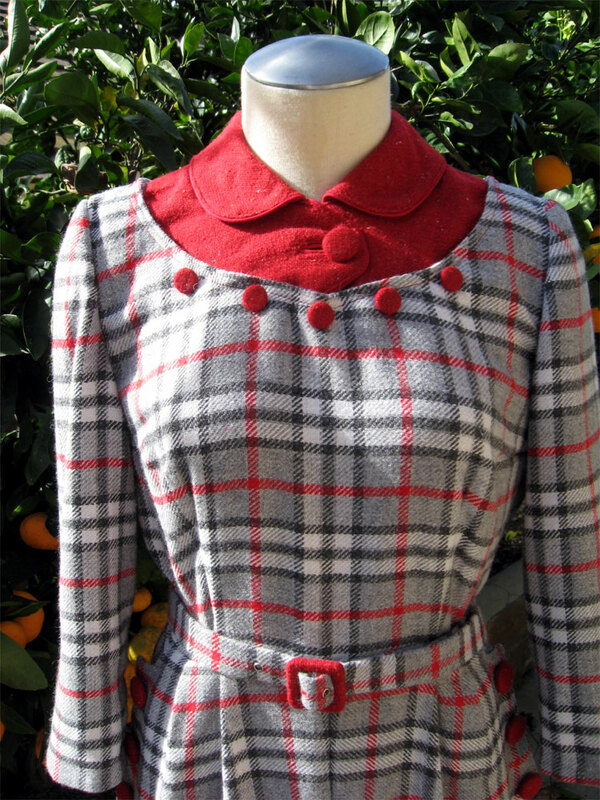 Oh how I wish I could sew like that! >That is seriously adorable! I love all the details – good choice of A+B! >wow, I gasped out loud when I saw this dress. just freaking beautiful. >Adorable!!! I love the fabric. I hope you had a wonderful Christmas! 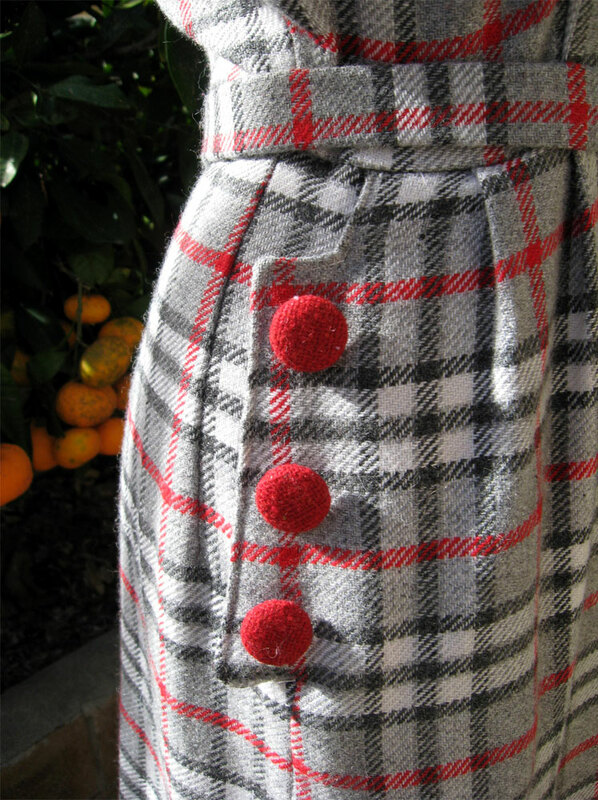 >WOW, I am quite impressed by your craftsmanship and those details – love the buttons!